Happy Friday Everyone! 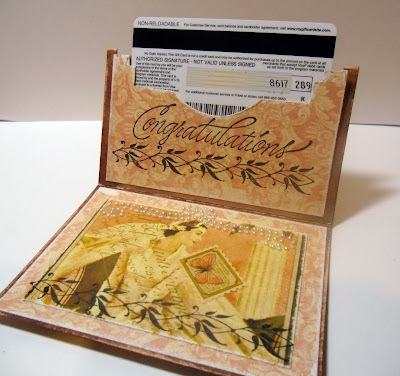 Today I have a Vintage Gift Card Holder to share with you, this was a lot of fun to create. I found just the perfect stamps to use at The Rubber Cafe, I chose G-765 Congratulations, G-718 Vine Border and C-336 Swirled Bells. I tied the gift card with a Olive Green Satin ribbon just to make it look elegant. 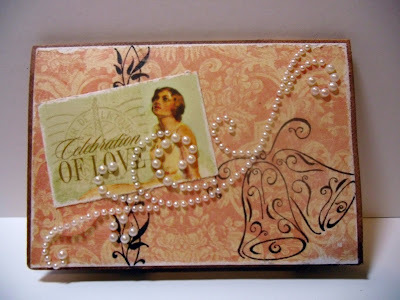 .I used Le Romantique pattern paper collection from Graphic 45 and Finesse Swirls Pearls from Want2Scrap. I cut decorative pieces from the pattern paper, sanded the edges and stamped the Vine Border at the bottom, added a Kimmie Bracket Pearl from Want2Scrap at the top and repeated the step for the back side of the holder. it.﻿ The ink stay really wet so it was easy to blend the entire gift card hold with just a little ink. 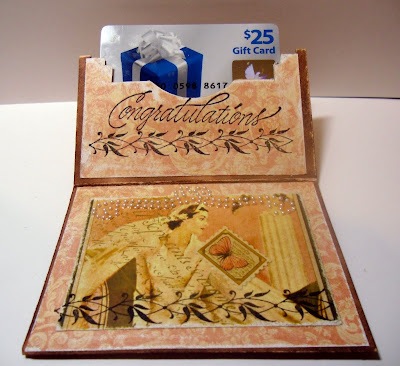 I stamped the Vine Border and Congratulations and slipped the gift card between the layers after I die cut the slit with a Spellbinders die. Here's a close up to see that both sides of the gift card holder are identical. I just love that Vine Border, I think I use it alot, I guess should see about getting another border to use but this one is my favorite. Last week's challenge winner will be posted at the bottom of this post. 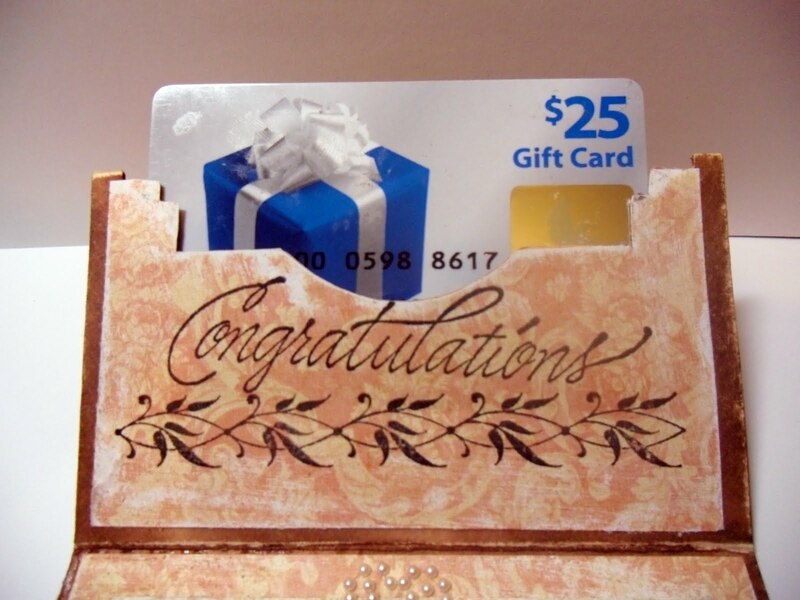 Most of us hate the idea of gift certificates or gift cards. It feels so impersonal. So...why not make it more personal. 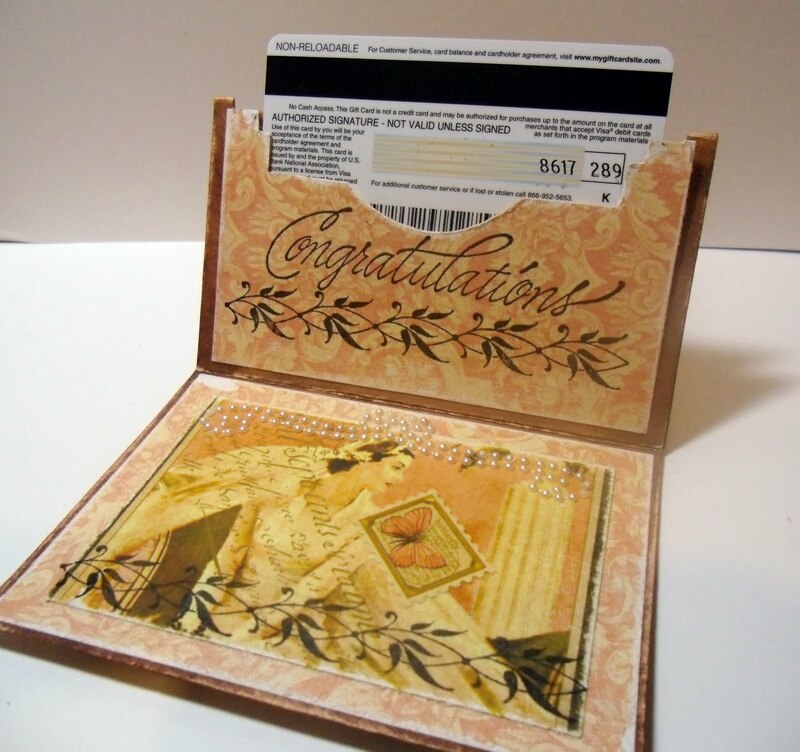 The challenge...create your own personal gift card holder. The gift is not just the gift card...but the holder as well. For today's sample...I combined the last challenge with this challenge. I thought I would leave you with one more Christmas card and add a little something extra for the inside. 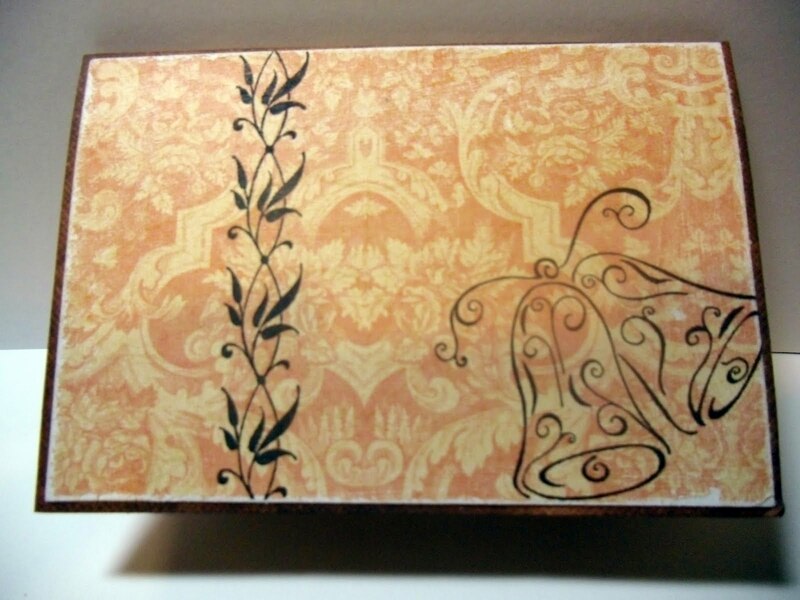 The front is stamped with Background Basics 2. I stamped the Small Thistle Flower on red card stock a couple of times then cut them out and layered them to look like a poinsettia, adding gold dots with a gel pen to the center. The leave were made from a strip of green card stock folded in half and run through a crimper at an angle. Cut and unfold to form the leaves. The die cut on the front of the card comes from a Cricut cartridge...don't recall which one. 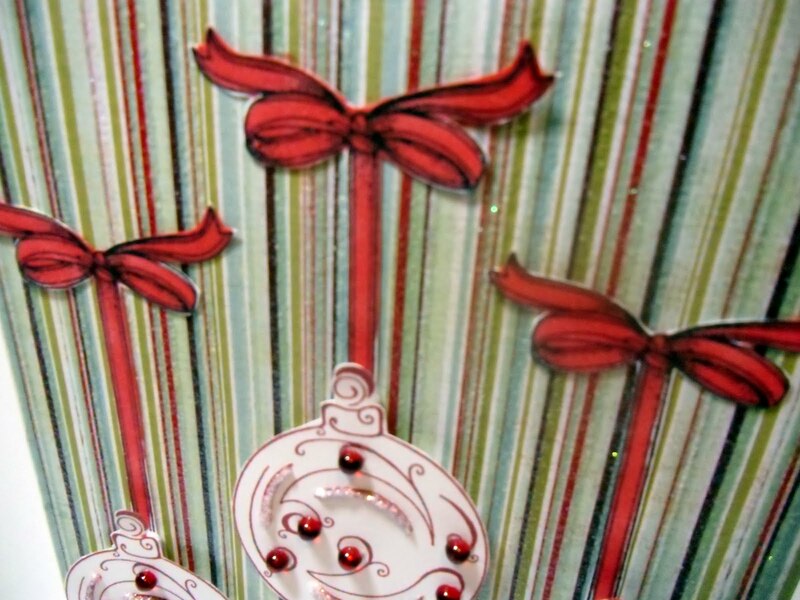 The inside of the card was stamped with Background Basics 2 and the holly border stamp from the set Christmas Tidings. Also from Christmas tidings, the Happy Holidays sits behind the gift card. When the person takes out the gift card, they'll see the greeting. I didn't realize how crooked the pocket was till I took a few photo's and took a closer look. I tool a piece of card stock and scored at 1/2 inch on one side and the bottom. I folded the side and bottom to attach to the base card and cut the remaining section at an angle to form a pocket. 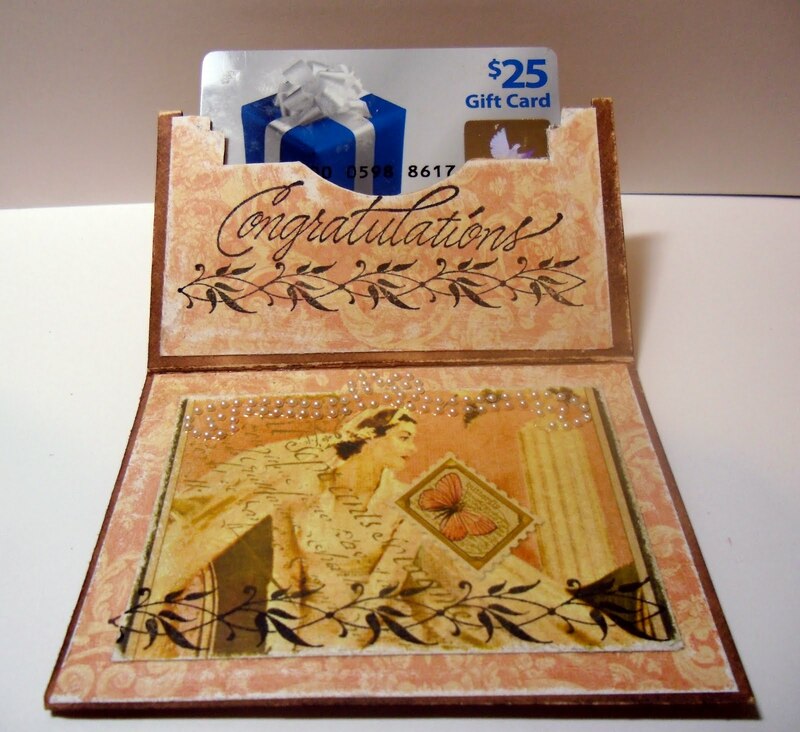 The pocket can be altered to fit larger cards or gift certificates. Now it's your turn. Let's see how you decorate your gift card. • Link your card below with Mr. Linky (in green). There may be a delay in showing the link, please be patient. *NOTE: Please enter only one card each week! Each week we will randomly draw a winner out of the projects that are entered and the winner will win a prize. Now...let's have a winner for last week's challenge. Congratulations Jackie Rakoski. Please send us your contact information to design-team@therubbercafe.com and we'll get that right out to you. Here are some other great cards submitted to us this week. Well I'm the last person that's anywhere even close to thinking about Christmas let alone making christmas cards but when this weeks challenge was posted to us I couldn't resist using these stamps. I mean seriously how cool is Santa on his summer holidays dancing under the party lights. I used a few different stamps from different sets on this one and I'll list them below. As for techniques, I played around with some ProMarkers and Copic markers and did some coloring and blending, I used Lil' inkers (best new tool set ever, you'll love em') and distress ink to stipple a background, and I used some Glossy Accents and Liquid Applique on Santas hat and shades. Hope you enjoyed our little bit of Christmas in July this week and be sure to come back this Thursday and see what our new weekly challenge holds in store for you. Also don't forget to submit your projects to our weekly challenges too as you get a chance to win a prize, I promise you'll love what we have to offer. When you're done all that don't forget to check out our Facebook page and our online store too for more great ideas and updates. 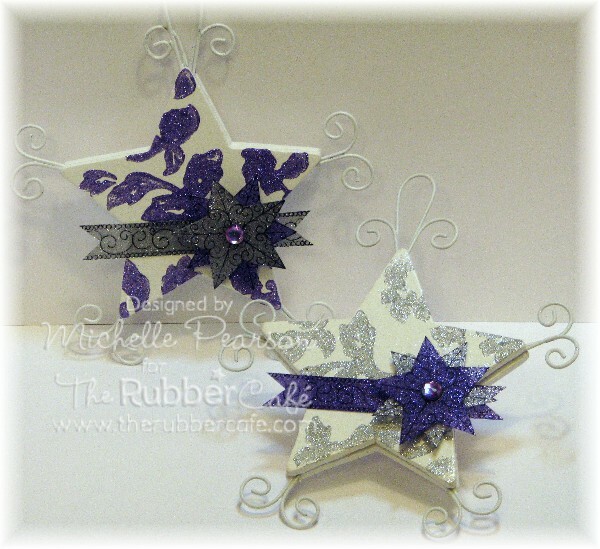 I stamped the Kraft card base with It's a Blizzard Outside and dotted some stickles in the snow star centers. 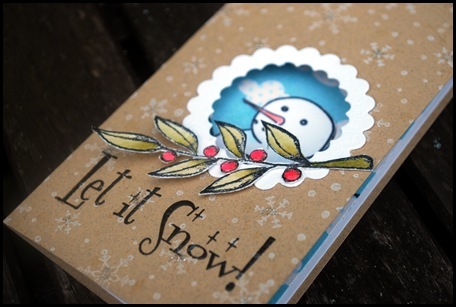 The cute snowman and sentiment are from the same set - Baby it's Cold Outside. And the branch comes from the Christmas Tidings set. The berries got themselves some Glossy Accnents. Here is a close up. Do you feel the Christmas spirit??? :):):) Here are all the details about the challenge. Hope you will play with us!!! This week's challenge at The Rubber Cafe is Christmas in July. You know how hard it is to make wintery things when the temps in our area have been hovering near 90*? This was truly a challenge!! I decided that there would be no red and green for me....so I decided to make some whimsical ornaments since I wanted to play with my You're So Fine Glitter and some of the Scrap Happy Sheer Glue. I took some white wood and wire ornaments I picked up a while ago and stamped Solid Leaf Pattern images that I *inked* up with Scrap Happy Sheer Glue randomly on them. Next I covered the swirls with the You're So Fine Glitter in Silver Medal and Purple Dress. Let the glitter and glue dry and then you can brush off any excess glitter clinging to the surface. You are left with a fun glittery brocade design. For my star and banner images, I stamped unages from the Ornamental Holiday set with black stazon ink on acetate. I ran my acetate through my Xyron sticker machine, burnished the glue to the acetate and then applied my glitters. The images were fussy cut and then applied with foam dots for dimension. I hope you are enjoying the winter inspiration we're sharing this week! Butterfly Magnet Gifts for Christmas! Although it may be difficult to get into the spirit of Christmas in all this heat, it is possible! Today I am going to concentrate on a great Christmas gift-giving idea for your friends. Look at these little beauties! What friend wouldn’t want a set of magnets to help get them organized! I had a great time making them and they will make great stocking stuffers for anybody. 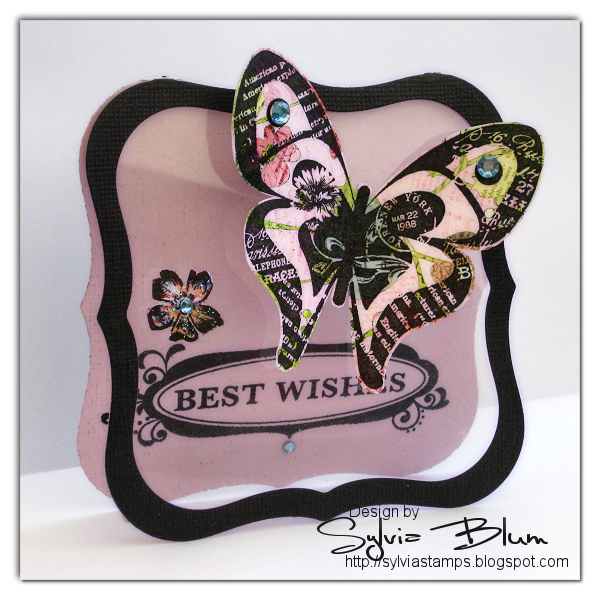 I first took the beautiful butterflies from the Butterfly set and stamped them on cardstock using Tim Holtz Adirondack Ink. I then used the Versamark ink pad to cover the butterfly. Next I added the BEAUTIFUL Your so Fine Diamond glitter to each butterfly. Look how they sparkle! So pretty. Last but not least I covered the butterflies with Crystal Lacquer and let them dry very well. Finally I used Want2Scrap adhesive rhinestones for the center. A dab of Scrap Happy Glue on a magnet back was all that was needed to complete each one. So the next time you’re looking for a little stocking stuffer look no further. You can make these instead!! I hope you’ve enjoyed my project this week. Did You Say Christmas In July? Ok, I have to admit working on a Christmas Card in 110 degree weather just didn't make it easy to be festive..he he but with that being said I pulled it off. 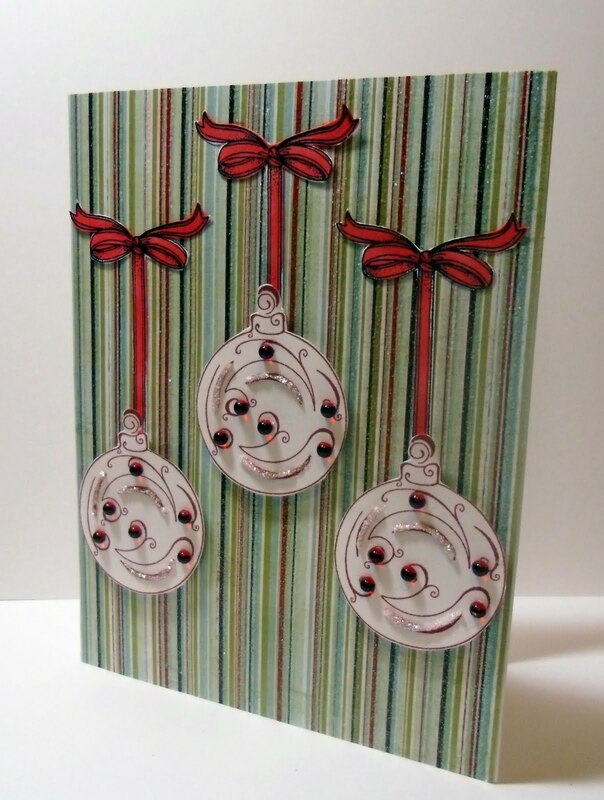 Today I have this quick and easy holiday ornament card. I used I-966 Swirled Ball with Hanging Ribbon from The Rubber Cafe﻿. I stamped the image with Vineyard Berry ink and colored the ribbon with Copic Markers. I hand cut each of the pieces out and adhered them to the card front. 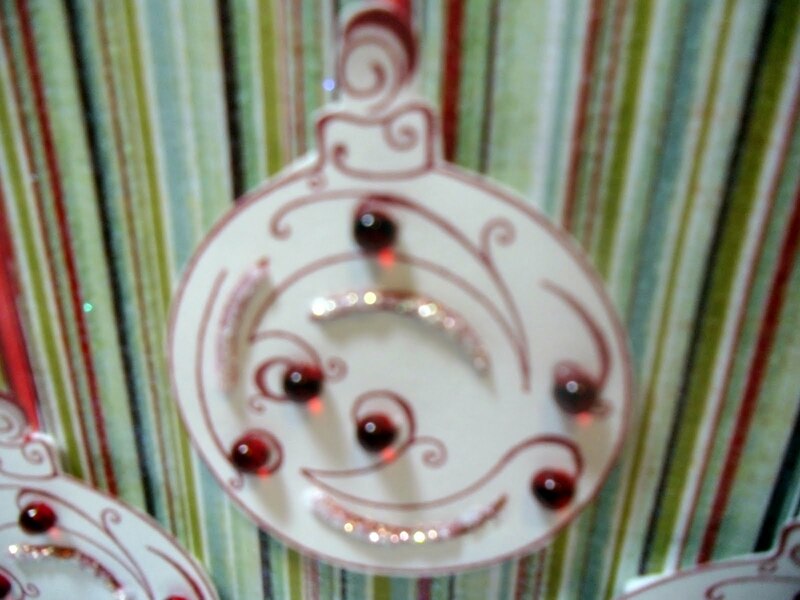 Once they where adhered I took JD008 Holly Berry Red Jelly Dots and adhered them to the ornament. I then took Your So Fine Diamond Clear Glitter and mixed it with adhesive and carefully put it on my ornaments. 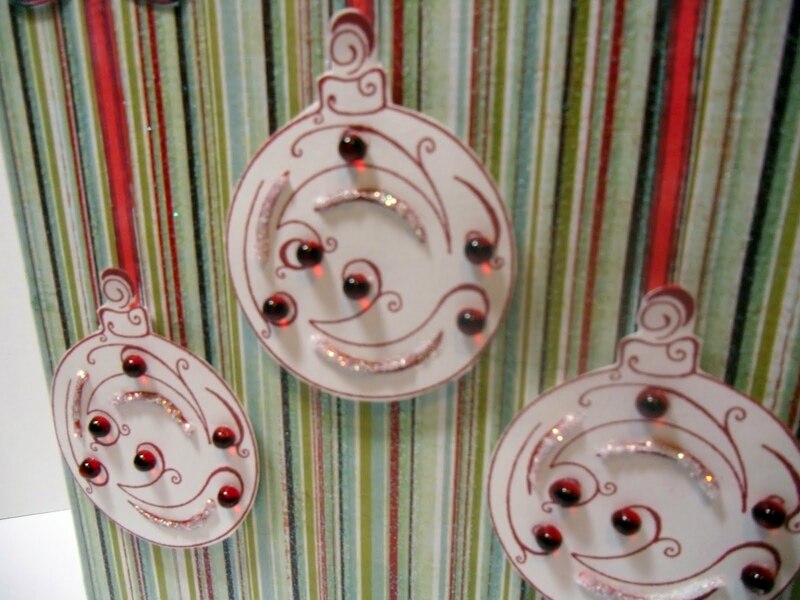 I repeated these steps to create all three of the ornaments and then placed them in a pattern on my card front. Merry Christmas and Happy Holidays...in July. Oh yes...and happy Thursday while we're at it. If you're anything like me...not that you are...I'm going crazy on December 24th finishing up last minute cards to hand deliver later in the day. When there is shopping to be done and food to be cooked...why should we be worried that we didn't finish our Holiday cards. Here's a challenge to get the ball rolling. For my sample today I've used the Stitched Snowman for my main image. He sort of sits over the top to make a 4 1/4 inch square card into a standard A2 card (4 1/2 inch x 5 1/2 inch). 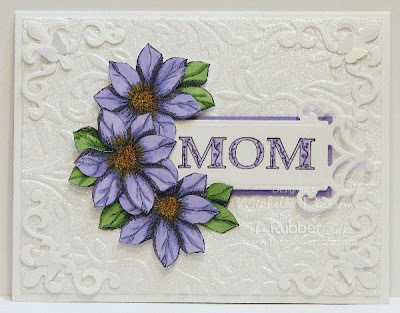 The base of the card was layered and stamped with It's a Blizzard Outside. The sentiment comes from the set Warm Wishes. It's actually an entire verse, but I just masked off the area I didn't want and inked the stamp to get just "warm wishes". 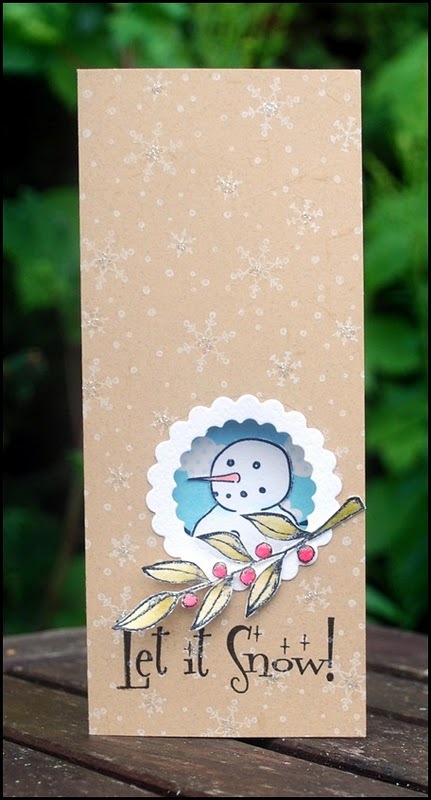 The base of the card was punched with the edge of a circle punch to look like the spellbinders nested small labels...used behind the snowman. This challenge is open to any winter holiday. 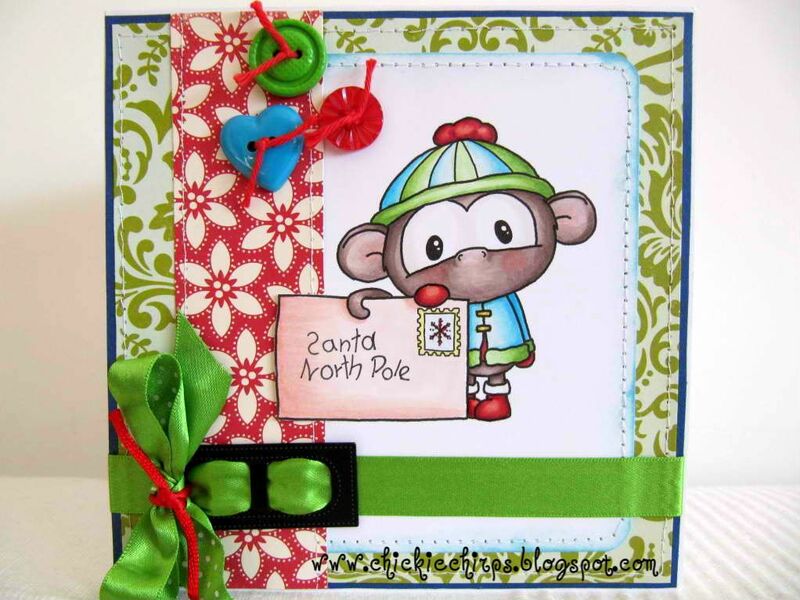 Come play along and show us your holiday cards/projects. I was looking at pictures from different websites of Summer CHA...and oh my oh my...the new Spellbinders are going to kill any chance I have of saving money this year. For now I'm playing with a few oldies but goodies. Kind of funny to call them that because they weren't even a thought when I first started. I can remember wanting every new punch that came out...funny thing is if they didn't break...I still use (most of) my punches too. For today's card, I used spellbinders Peony and Standard Circles sm...largest of both. The Peony was cut on the fold to create a card base and adhered to the circle. 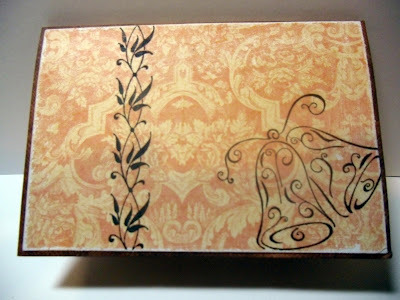 I die cut a smaller circle and ran it through an inked embossing folder from a Cuttlebug combo set, Damask Frame. I stamped the Large Celtic Rosette on kraft cardstock and die cut it with the Peony to match the card. 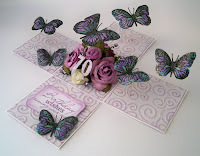 The Butterfly comes from the Butterfly set which has 4 beautiful butterflies that are sold individually in larger sizes. The word dream...also on Kraft cardstock...was stamped using one of the background stamps from the Vintage Treasures. 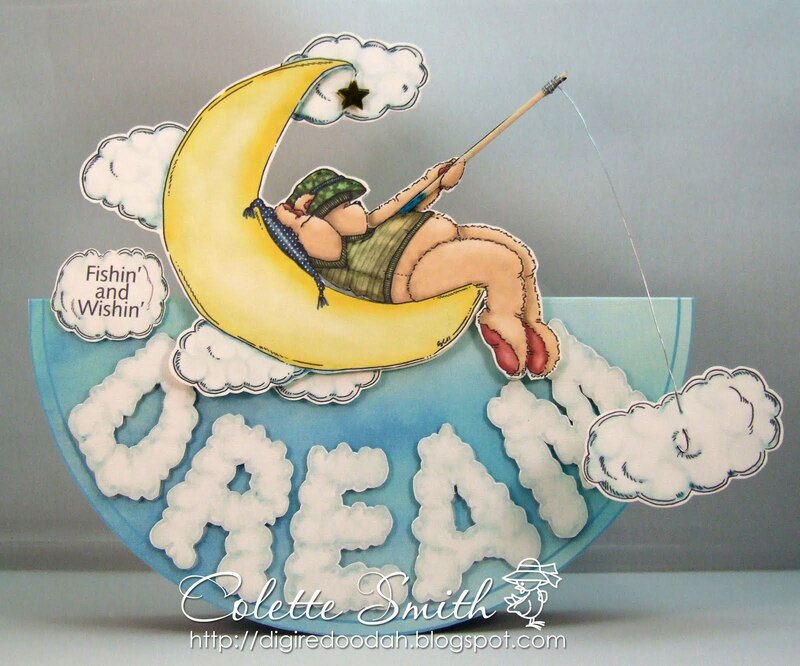 I masked off the words around it and then inked the stamp...so that I could stamp just the word "dream". I finished off the card with beautiful pearl jelly dots. That concludes this weeks challenge. If you would like to get in on our challenges, be sure to check back every Thursday afternoon for a new challenge post. Who was this weeks winner you ask? Chris O. for this beautiful butterfly slider card. Congratulations Chris O. Please send us your contact information to design-team@therubbercafe.com and we'll get that right out to you. Hello! 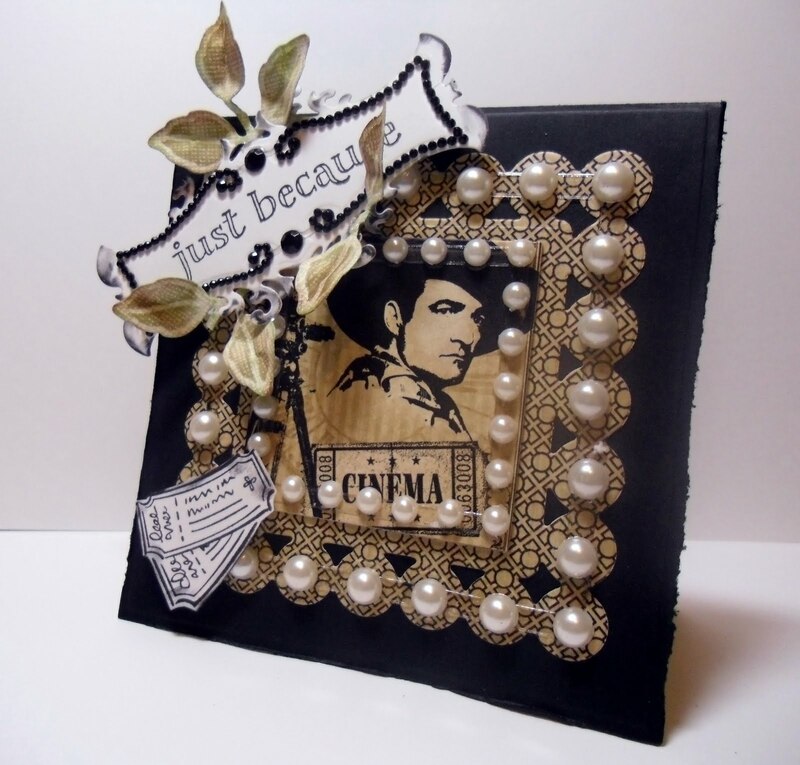 Are you having fun with our Spellbinders week??? Love this stuff so this was an easy one! Here I’ve combined the Hey Cupcake! 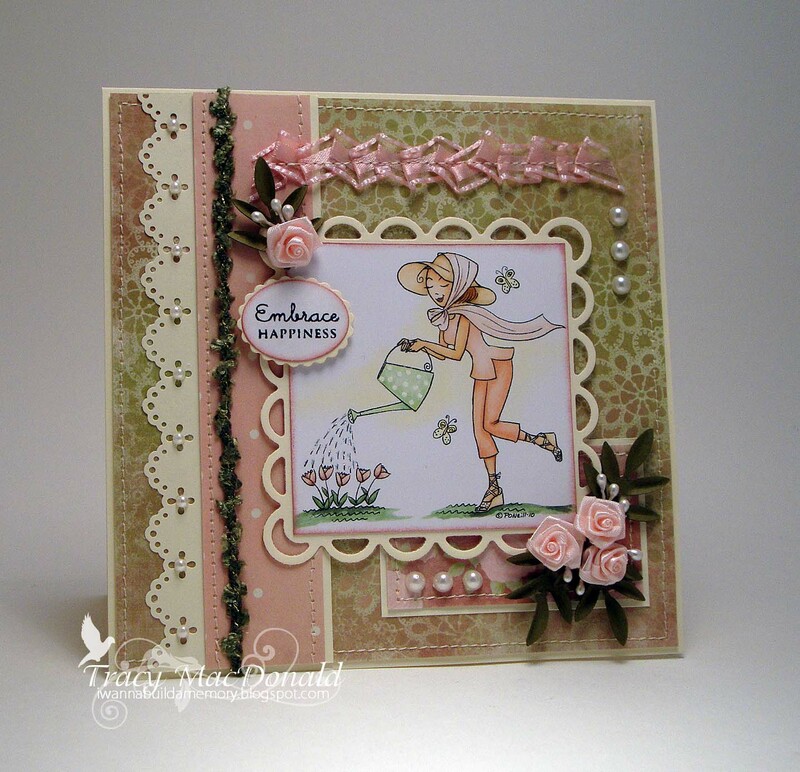 set with some looovely Spellbinders Floral Doily Accent Shapeabilities. Sketch used is from Clean & Simple. All info and linking tool can be found in this post. I hope you will play with us!!! Whoot! I had fun with this week's challenge for The Rubber Cafe! 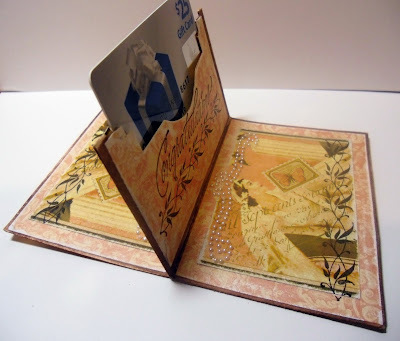 The challenge is to use Spellbinders...and that was no hardship! 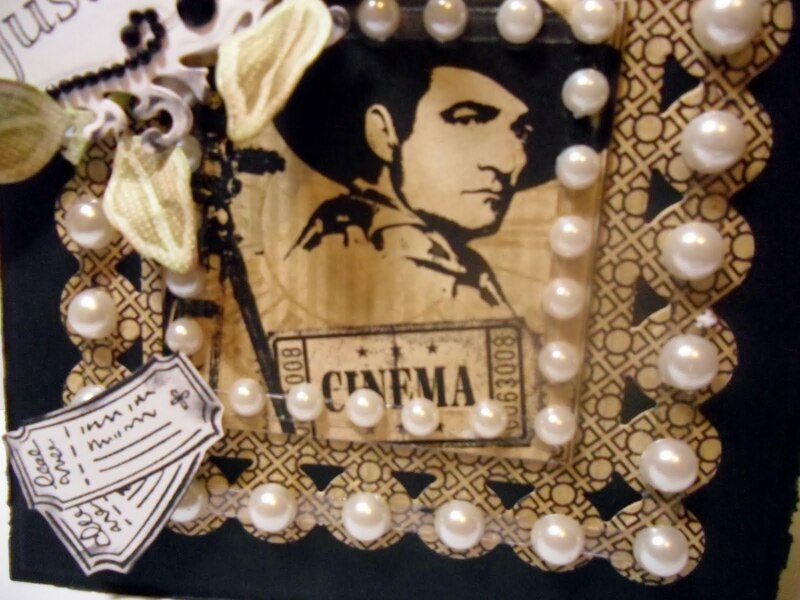 I used the corners from the Fleur De Lis Accents set and paired it with a tag die from the Fancy Tags Two set. Another favorite thing of mine is glitter...and I used the You're So Fine Diamond Clear Glitter on my creation. I ran a 4 x 5.25 inch piece of white cardstock through the Xyron sticker machine and then covered it with glitter. 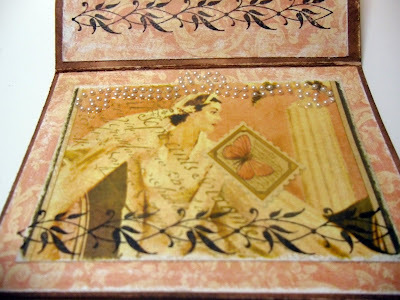 Next, I ran my panel through the Cuttlebug Victoria Embossing Folder...instant textured glitter cardstock! This glitter comes in a huge jar at a great price...what's not to love?! I used the Small Thistle Flower, but colored it as a clematis this time. I love stamps that can do double duty! I colored an additional flower green and cut it apart to use for my leaves. 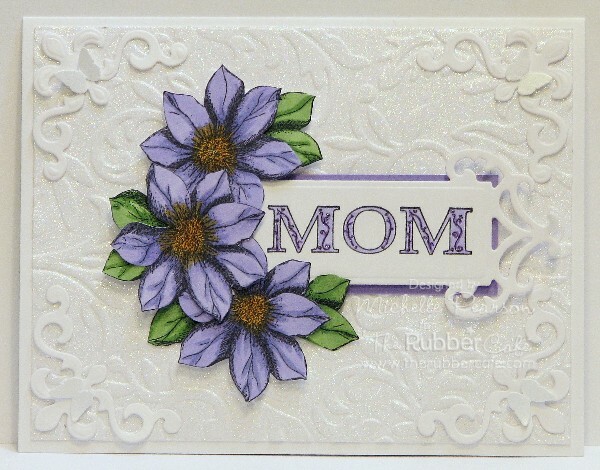 Mom comes from the Give Momma Some Love set and is colored with Copic markers and accented with a Spica Glitter pen. 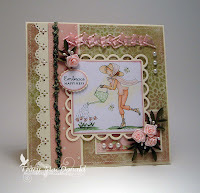 Be sure to join in the fun and share your Spellbinder creations with us! Check out all of the challenge details and prize information on The Rubber Cafe's blog. I have to say these challenges have really helped me keep my creative mojo going and this week is no different. I love being able to think about a challenge and see what comes of it. I hope you’ve been inspired by the wonderful challenges thus far as well! This week we were to use Spellbinders products in a card. I had so much fun making a shape card last week that I decided to do another one but use the Spellbinders Nested Butterfly set that my friend had. Then I stamped with the Rubber Café Background Basics Dot stamp in Versamark and clear embossing powder. Love that background stamp! Here is a close-up of the Get Well sentiment from the Fabulous Phrases stamp set. Yes that is my “go-to” set. I use it ALL the time! To finish the card I adhered the Want2Scrap Nestabling Fleur-de Lis and one of my hand-made flowers. • Link your card to this post with Mr. Linky (in green). There may be a delay in showing the link, please be patient. * NOTE: Please enter only one card each week! Each week we will randomly draw a winner out of the projects that are entered and the winner will win a prize. This weeks prize is a $10 gift certificate to The Rubber Cafe store. It is Friday again and I am on my way to Chicago for CHA but first I have this little creative card for you. 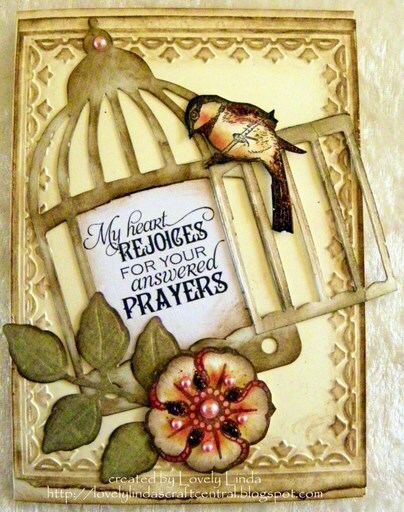 I used C-388 Just Because from The Rubber Cafe﻿, stamped the sentiment on the S5-030 Fancy Tags Two from Spellbinders and added some Nestabling from Want2Scrap. 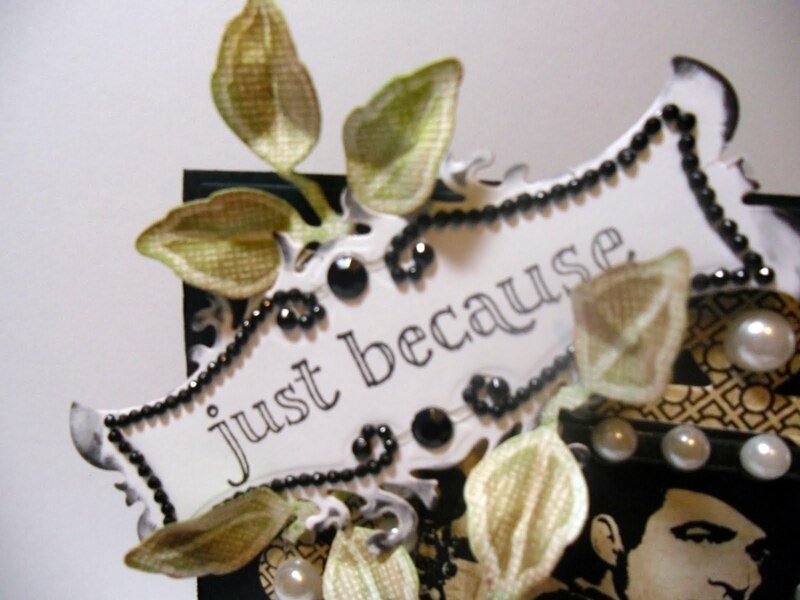 I added some S4-328 Foliage from Spellbinders to the stamped tag to make it pop even more. 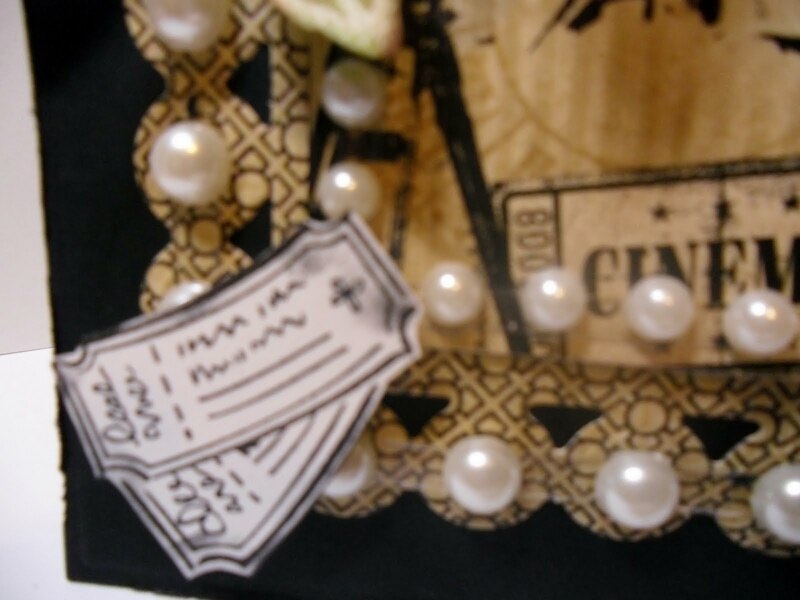 The old cinema paper is Curtain Call from Graphic 45, It just went so well with The Rubber Cafe B-263 Tickets. 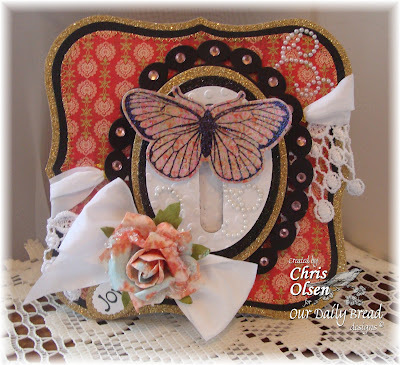 I die cut the S4-315 Beaded Square from Spellbinders out of the Curtain Call pattern paper and added the Nestabling Pearl Beaded Square from Want2Scrap, I think it just made this card look so elegant. Just a quick note to say that the winner of last weeks challenge is at the end of this post. Now...on to today's challenge. A lot of us have the spellbinder addiction...I know I'm one of them. I was going through the spellbinders website the other to make a list of spellbinders I didn't have that I wanted...the list wasn't as long as I thought it would be. So...for this week's challenge I want to see what you're doing with your spellbinder dies, whether you have one or two...or you're an addict like me. My card today features eight different spellbinders from seven different sets. I used Long Classic Scalloped Rectangles, labels three, five and fifteen, fancy tags (two different tags from that set), lattice borderabilities and then popped the kitty on the standard circles small. The outside has the kitty from the You're Purrr-fect set and the name of the floral wreath escapes me at the moment...I'll have to look that up and get back on that. The inside has the words from You're Purrr-fect on one of my favorite tags from the fancy tags set. 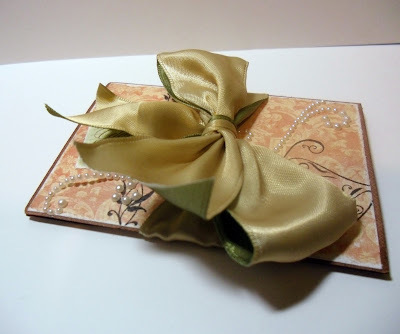 Backed with orange, to give it a little bright pizzazz, and "Z" folded, this card is finished off with an orange ribbon that I layered over a strip of One and Only tape in a ruffle. I can't wait to see what all of you do with your spellbinders. Over the the last few months we have been doing these challenges and have had great response. It's hard to pick just a few to display here on our blog. Coming soon...not sure if it's next week or the week after...when you upload your link, you'll be able to choose a picture of your project to share. I can't wait. I love what everybody has done. Be sure to leave us feedback and give the design team some love. So...who won last week...you ask?? Congratulations Martha. Send us your contact information to design-team@therubbercafe.com and we'll get your prize right out to you.